Designing interiors requires knowledge of good design principles and some artistic ability to communicate your design ideas with your clients. Having good ideas in your head is not enough: you must be able to put those ideas on paper, visually, so the client can see what you imagine. Most interior designers maintain a tool kit of equipment used to create great designs and then present them to clients. Keep color samples on hand to show clients. Collect and curate good period design books. Look for picture books that portray noteworthy interiors from numerous eras and cultures. They inspire wonderful ideas for modern, eclectic treatments. Do not overlook certain motion pictures, old television shows, art collection guides and old print advertisements for ideas. 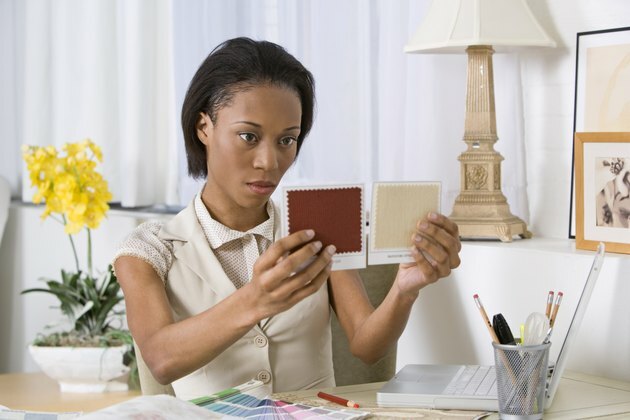 If a room arrangement, furniture piece or color scheme catches your eye, add it to your idea file. Good interior design is timeless, so do not worry about dated reference materials. Gather swatches and samples of the materials used in interiors, including wood stains and treatments, paint colors, faux finishes, natural and engineered stones, carpets, rugs, tiles, engineered floor coverings, wallpapers and fabrics for upholstery and draperies. Your collection needs to be vast and yet organized for easy handling. Mount swatches on sheets of hardboard to keep on file in your design office. Manufacturer product catalogs for furnishings and lighting instruments are also crucial. Equip yourself with a large drafting table with a built-in ruler and square system mounted on wire cables. If your office is too small for a stand-alone drafting table, purchase a desktop model that you can put away between jobs. Add bright halogen light for your drafting table and a comfortable drafting chair or stool. Invest in professional mechanical pencils in .05 mm and .07 mm lead sizes. Purchase a variety of leads rated from softest to hardest. An electric lead sharpener is helpful, as is an electric eraser. Have a good metal ruler, engineer's rule, plastic triangles and a collection of geometric shape templates in 1/2-inch and 1/4-inch scale. A set of professional line inking pens comes in handy, as does high-quality vellum drafting paper. Choose a comprehensive color wheel that provides plenty of tertiary colors, in addition to the standard primary and secondary colors. Acquire a set of professional marking pens in a wide range of colors, colored pencils and oil crayons. Watercolor paints and brushes are also useful. While representing color is crucial to most design work, you may also employ finely detailed gray-scale pencil drawings and charcoal presentations. Keep a stock of large foam core mounting boards, drawing paper and watercolor paper on hand. Competency in computer aided drafting software is increasingly important to interior designers. CAD software can save hundreds of hours of effort and provide a flexibility that you cannot achieve in hand-drawn or hand-colored work. With three-dimensional CAD illustrations, you can choreograph views through a space to simulate a walking tour for heightened realism during a presentation. Smart phones and tablets put interior design technology in your pocket. Downloadable apps let you sketch, capture colors, draft floor plans, organize client files and add three-dimensional furnishings to interior photos.